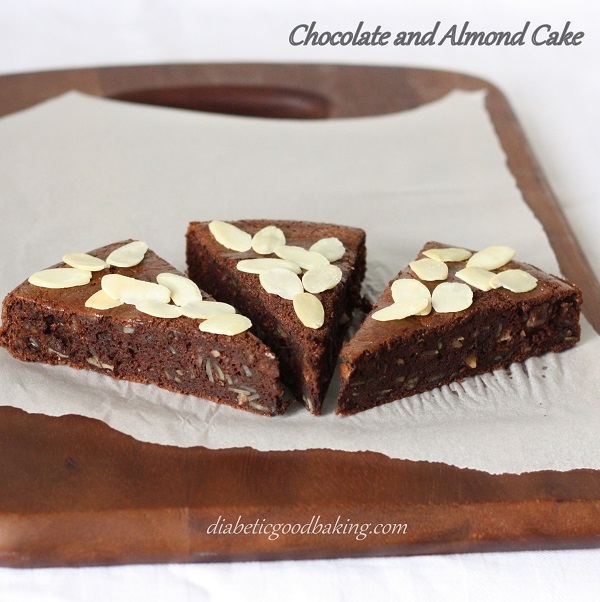 Simple and quick recipe for low carb chocolate and almond cake. You don’t need many ingredients and about 40 minutes to make a cake (including baking time). The cake is very chocolaty and light. If you are not afraid of extra calories and a little bit of sugar serve it with scoop of vanilla ice-cream. I used Splenda as a sweetener and Menier dark chocolate in this recipe. If you would like to make this cake even lower in carbohydrates use pure Stevia leaf (you will need just a teaspoon or so) and chocolate that is in lower in carbs than 30g. · Preheat oven to 180C and butter a 23 cm springform pan. · Melt the chocolate and butter in a large bowl over simmering water. Stir in almonds and set aside to cool slightly. · In a medium bowl using electric mixer whisk egg yolks and sweetener until mixture gets smooth and pale yellow. Slowly add the egg yolk mixture to melted chocolate and stir to combine. Stir in almond extract. · Pour the batter into the form and bake 20min. Cool slightly and decorate with almond flakes. Hello, how come you used 18g of splenda if the it calls for 180g of sugar? isn't it supposed to be equal? Hello! Do you think this would work as well using coconut rather than almonds? Looks great, and I'll try this cake for sure!